Four years ago sending my daughter Makenzie to school was the last thing on my mind. 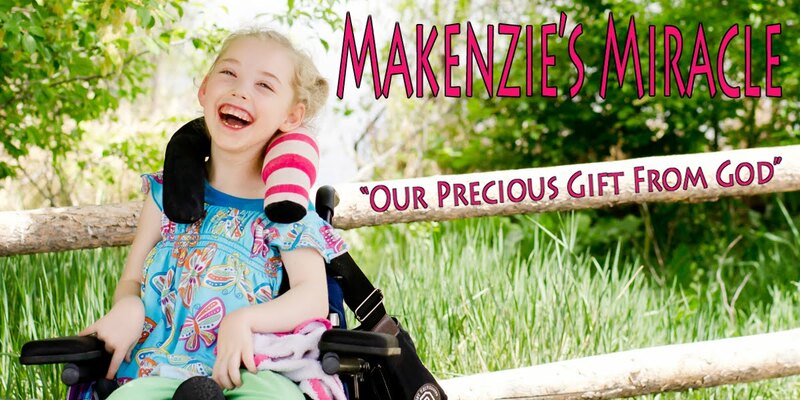 After a choking accident caused a very serious global brain injury Makenzie was unable to walk, talk, smile, sit on her own, or even eat. I spent hours day after day consoling, feeding, researching therapy treatments, doing therapy, traveling, and trying to manage her care, take care of my other children, and keep up a house all at the same time. As Makenzie slowly approached three years old, the idea of going to preschool became the talk of the town. I had no idea what sending my little girl to school even looked like or when we would fit another activity into our daily routine. After some convincing by Makenzie’s Early Intervention team I decided to start the process of having Makenzie evaluated by Child Find. The reality of sending Makenzie to school was a very different reality then I had experienced with my other three children. This was not going to be a simple process of filling out a package of standard contact information, buying a list of supplies, meeting the teacher at sign in day and then off they go on the first day of school with a few kisses and many tears of joy and sadness that your baby is growing up. Instead there where going to be evaluations, specialists, district employee’s, differing opinions, tears of anger and frustration, laws, rights, talk of budgets, red tape, and big words that no parent should ever have to learn the definitions for. The first three years Makenzie was in school I advocated for her……. but failed miserably. I ended up pulling Makenzie out of school six weeks into Kindergarten and home schooled her for a year. During that year I spent a lot of time educating myself on special education law and Makenzie’s right to a free and appropriate education. I researched integration and least restrictive environment. I learned all of the definitions to the big words and was fluent in a whole new language. During the summer we moved and I had a chance at a fresh start with a new team. Armed with more knowledge I was bound and determined to concur the IEP process. Makenzie was going to get the education she deserved. Today Makenzie is in a class with 23 of her peers. She has a one on one aide (who is amazing by the way) to assist her at all times. The classroom teacher does a wonderful job of making sure Makenzie is learning and integrated. The special education team is phenomenal in supporting Makenzie outside of the ILC classroom. For the most part communication with the staff has been great. Makenzie also has many friends, uses her walker, and for icing on the cake…..the district even purchased Makenzie a talker for her use at school. Over the last couple of years I have learned a lot about special education, the IEP, FAPE, IDEA, and how to make it all come together for my child. So without getting into a whole how-to lesson on IEP’s here are a few of the major things I found work the best in this process. In my opinion the first and most important thing to remember is that even though getting your kiddo with special needs into school successfully can be frustrating it is imperative that you keep emotion out of the picture. This is a business deal. It took me over 3 years to figure this one out and is very hard when you love you child, know what they need, and can’t figure out why there is red tape surrounding so many of the things your child deserves. While we just want our children with special needs to have the same experiences as their peers many of them cannot tell us about their day nor can they independently perform many of the tasks their neuro typical peers can. They need immensely more than other children their age and their goals and education needs look so different then what we imagined. It is emotional. It is hard not to cry or become angry but it is so very important that you do not take those emotions with you to any meetings at the school. Take a deep breath and continue to remind yourself that this is business. Now that our emotions are under control learning the law is of up most importance. When I started to get serious about my daughters right to an education I had the IDEA statute printed out and bound. It became my new best friend. It is so much easier to “argue” with someone about red tape, procedure, funding, and other legal matters, when you know just how to stick it right back at em’. For example I knew my daughter needed assistive technology (AT) in the form of a talker with eye gaze. I knew the school knew the same thing. Heck it was even in writing after their own evaluation but yet they kept trying to get out of putting it in her IEP because she did not have a device. There were some very intense IEP meetings surrounding this issue but I knew the law that was tucked so neatly into the IDEA about AT and what was legally required on the districts part. The end result…….. A district funded talker with eye gaze at school for Makenzie. The third on my list of important things to remember is follow up. This is an art. In order to follow up well you need to learn how to write letters. Not just any kind of letter but one that is always positive and fact based. Remember we are keeping our emotions at bay. I follow up on everything. If I talk to a teacher in the hall, have a conversation with the principal on the phone, when I meet with the specialists, and of course follow up is essential after formal meetings. Even if I am fuming mad I always start with thanking the recipient for something. Next I state the facts i.e. : exactly what was discussed, or specific events. I then recount what I heard and understood and sometimes that is it…….just follow up. Other times there is the need to ask for another meeting in order to further discuss a solution to any issues which were not resolved or that need to be corrected in your child’s IEP. If so, just state kindly that you would like to hold another IEP meetings so that the team can more thoroughly address any issues that have come up. Keep your paper trail. It may come in very handy one day! Last but defiantly not least……. never lose sight of what this process is all about. You’re Child! This is not about professional ego or the need to win. Never let what drives you become about anything but what your child needs and deserves. Remember what you are advocating for and don’t be afraid to ask for help. There are many organizations out there that will help you navigate this process and most of them are completely free. Check with your state or county organization for specific state resources. A couple of really great nationwide recourses are The ARC and Family Voices. Parent to Parent is a great parent board and Wright’s Law is a wonderful resource for questions on IDEA law. Take another deep breath and go get your child the education they deserve! Love LoVE LOVE the picture of Makenzie playing football - though the best has to be Makenzie sitting on the floor with her peers. WOW! I wish every parent was as educated and proactive as you are. I am a kindergarten teacher and I can't tell you how many times I have tried to fight for a child to get the services/equipment/etc that they need to be successful, only to be told that it's impossible by the "laws." With more parents like you, maybe one day the "system" and the "laws" will be changed to HELP children.